M Members represent some of the best and the brightest minds in the industry, and participate in a community of sharing that facilitates exchanges of new ideas and best practices. This collaboration demonstrates our commitment to continuously deliver significant value to Member Firm clients. Member Firms are also actively involved in preserving the ability of clients to effectively plan for the future. Twelve Member Firm Principals have served as President of the Association for Advanced Life Underwriting (AALU), the life insurance industry’s preeminent advocacy organization; dozens more have served on the AALU Board and various committees. M Financial is the only independent producer organization that is an active member of the American Council of Life Insurers (ACLI). Collectively, M Member Firms are among the largest buyers of insurance and financial products in the nation. In terms of purchasing power, M Financial’s results tell the story. 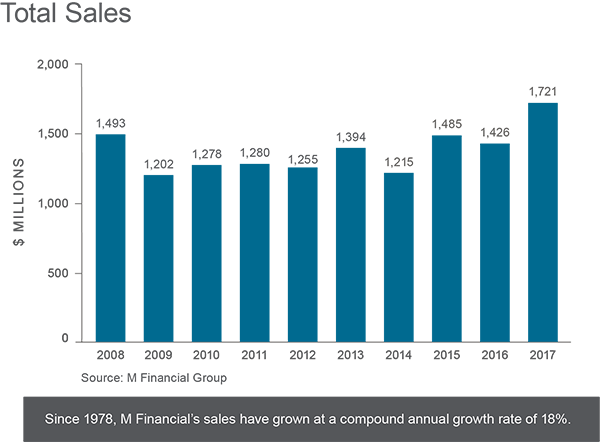 Since 1996, M Financial’s sales have grown at a compound annual growth rate of 11%.